Gold, the metal dear to Indians, is becoming less valuable. On 15 April 2013, gold was around 20% cheaper than its all-time high of Rs 32,460 per 10 gm achieved on 26 November 2012. Don't get tempted by the falling prices of the yellow metal. Gold, say market experts, can slide further to return a loss during the year, after 12 consecutive years of annual gains. Commodity experts cite the ongoing financial crisis in the Eurozone and expected decline in India's gold imports as the reasons. 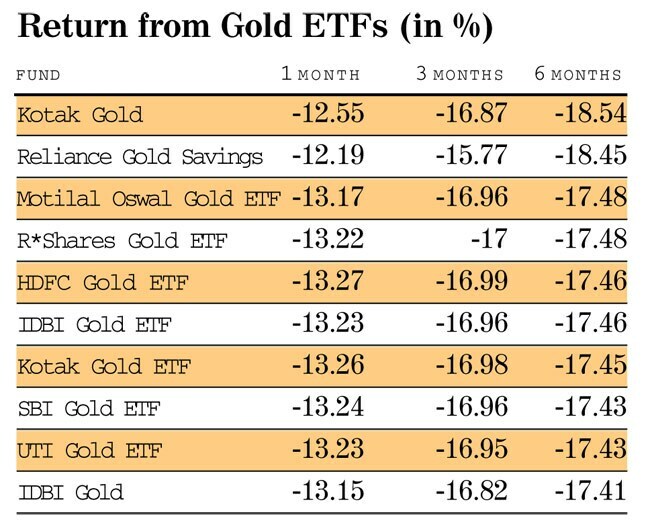 "The major rally in gold has come to an end. Any price appreciation in three-four years will be moderate. Investors should buy gold only if they can stay invested for at least 10 years," says Raghvendra Nath, managing director, Ladderup Wealth Management. Gold prices in the Indian spot market touched their lowest in more than 18 months on 15 April 2013-Rs 26,450 per 10 grams. On 1 April 2013, the metal was trading at Rs 29,526. "The present turmoil in the gold market caused due to the crisis in Cyprus may keep gold prices under pressure," says Vedika Narvekar, senior research analyst (commodities), Angel Broking. "In addition, the metal has lost its safe-haven appeal as risk appetite has increased due to improvement in the global economic outlook. Easing inflation in major economies has also diminished the demand for safe havens," Narvekar adds. In April, the US Dow Jones index touched a record; Japan's Nikkei also hit its five-year high during the month. According to a World Gold Council report, gold demand in 2012 was down by 12%. However, the market saw a 41% increase in demand in the October-December 2012 quarter from the year-ago period. The demand for the precious metal in the quarter was 261.9 tonnes in value terms. Demand for jewellery and investment reached their highest levels in six quarters. During the quarter, the demand for jewellery rose 35% year-on-year to reach 153 tonnes, while 108.9 tonnes was purchased for investment. In India, the prospect of increase in prices due to a hike in duty, which came into force in January 2013, might have encouragd people to buy. After the duty hike, India imported around 200 tonnes of gold in January-March 2013, a 24% decline from a year ago. "Fall in gold demand is seen as the result of hike in the import duty to 6% that was announced in 2012," says Narvekar. According to Crisil Research, if gold prices sustain at lower levels, consumption could grow at a faster pace. However, volatility in prices could limit investment demand in the near term. The prospect of any meaningful recovery in gold remains weak. "Given the lack of any major triggers in the near term, gold prices are unlikely to reverse the downtrend anytime soon," says Kishore Narne, head of commodities, Motilal Oswal Securities. "Small spurts in prices are very much possible, given the rate at which the gold's value has declined. However, such jumps will be followed by a decline in prices. The metal can retreat 12-15% from here in domestic markets during 2013-14," Narne adds. Basant Vaid, assistant vice president (commodities), Globe Capital, concurs with Narne. "The yellow metal can touch Rs 24,900 per 10 grams in the next few quarters," says Vaid.